How many status does a ticket have? How to identify status? - FAQ - Wisvia Forum - Powered by Discuz! One ticket has three status: Alert, In Process, and Resumed. 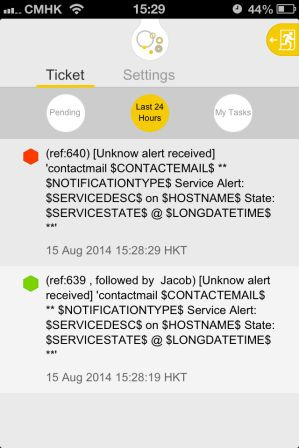 From mobile apps, status can be identified through a small hexagon logo with diffenrent color heading a ticket. 1. Red - Alert: Once there is a new ticket waiting for handle, or one ticket is released, the status is Alert shown as red. 2. 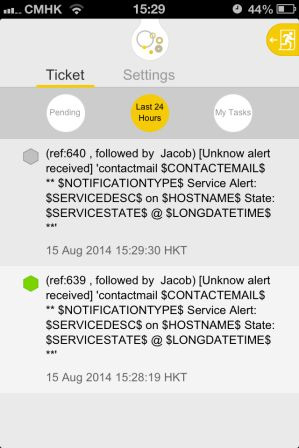 Grey - In Process: When the ticket is taken or assigned which means someone is handling, the status is In Process shown as grey. 3. Green - Closed: When the problem is solved and the ticket is closed. The status is Closed shown as green.